We set the bar high for professional roofers in the Angus area, so you can be sure you’re getting the best. 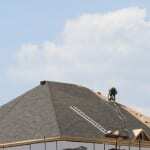 We have over 50 years of combined experience in the roofing industry. We stand behind our work. We offer a 10-year warranty on our workmanship to give you peace of mind that, should anything have been overlooked inadvertently, we’ll make it right. We do it all. We install, maintain, repair and replace roofs for homes and businesses. We’re precise. We believe professional roofers should focus on one job at a time and provide the special attention you deserve. This also means your job will be done in a timely manner. We keep it clean. You can count on a clean work site throughout your roofing project. We keep our word. We always explain the full scope of the project, so you never face something that goes beyond your expectation. The bottom line is that we treat you like we would want to be treated. Your home in Angus, Ontario gets the careful attention it deserves, and we stand behind everything we do, so you can feel completely confident that we are the professional roofers you need to get the results you desire. Contact us today with any questions you may have or to schedule a free consultation and estimate appointment. At Slippery Slope Roofing, our professional roofers proudly serve Barrie, Orillia, Bradford, Alliston, Newmarket, Midhurst, Cookstown, Beeton, Innisfil, Angus, Collingwood, Wasaga Beach, Oro-Medonte, Midland, New Tecumseth, Clearview, Bradford, Essa, Stayner, Springwater, and surrounding areas of Ontario.